I'm a little preoccupied today, as I try to decide what I will be ordering from the new Annual Catalogue, through the Demonstrator PreOrder Program. It's important to have a strategy, especially this year, because the 2016/17 Annual Catalogue is epic! It's amazing! Start saving up your pennies loonies and toonies because you're going to need them. You might consider a second mortgage even, or at least selling off one car. 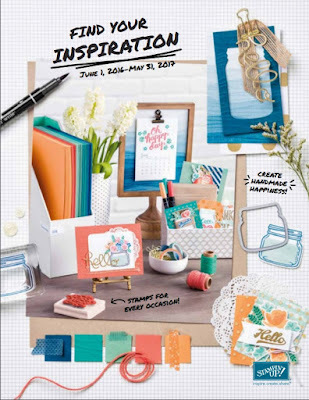 You're going to be holed up in your craft room anyway - you won't want to be driving anywhere! But seriously, I haven't squealed this many times looking through the catty in a long, long time! I can hardly wait until my order comes in so I can give you some sneak peeks! My Technique Night Classes are on this week and the theme is Mother's and Father's day (with alternate sentiments available)! 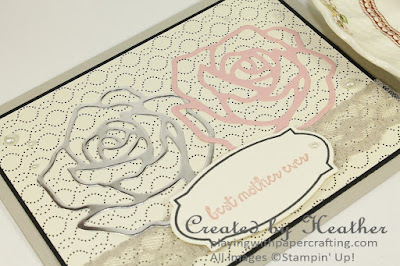 I needed one more sample and decided to get out the Rose Wonder stamp set and Rose Garden Thinlits. 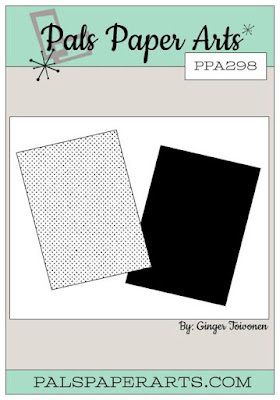 These two coordinating sets come in a bundle, and if you're seriously thinking of ordering them, do it before the end of May. Although they are not retiring themselves, the bundle will be. Stampin' Up! has a new policy regarding bundles. Products will be bundled only as long as the catalogue they are first featured in is current. They will not be bundled in subsequent catalogues. Which means you should be getting any bundles from the current Annual Catalogue or Occasions Catalogue before the end of May. 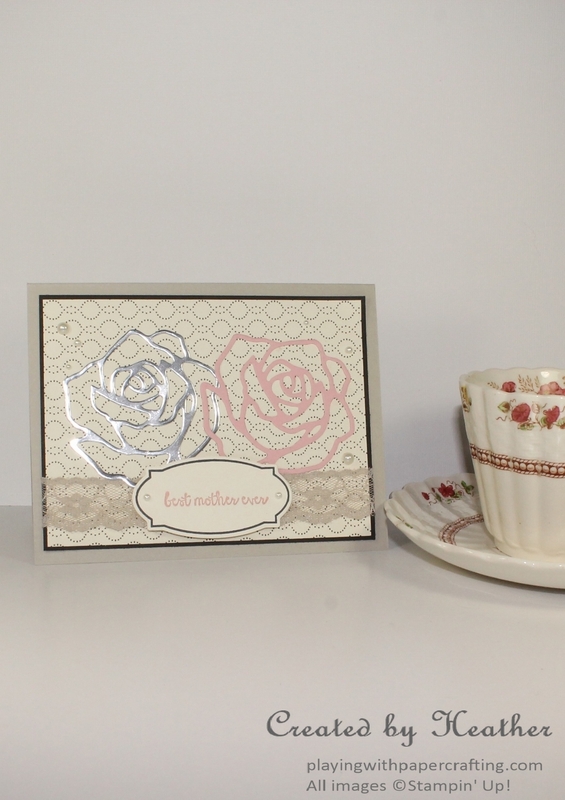 The roses, die cut with one of the Rose Garden Thinlit Dies, represent the two front panels. They are mounted on some Timeless Elegance Designer Series Paper. I was going to use the piece that has those beautiful shaded roses on the front, but the die cuts got lost with that paper, so I found a more subdued design from the same package and I liked the way they became much more visible. 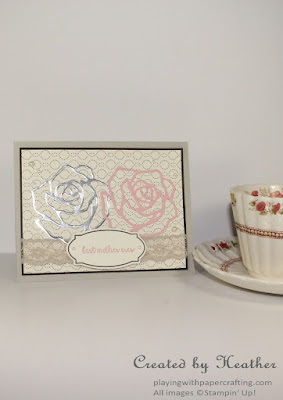 I die cut the roses from a Silver Foil Sheet and some Blushing Bride cardstock. I used the Precision Base Plate to do it. If you don't have a Precision Base Plate yet, you're going to want to get one. The number of intricate (and really beautiful) dies in the new Annual Catalogue has increased exponentially and you will have so much better success at getting all the little pieces fully cut when you use it. I added a piece of Sahara Sand Lace Trim to the bottom, because the card just seemed to need something else. 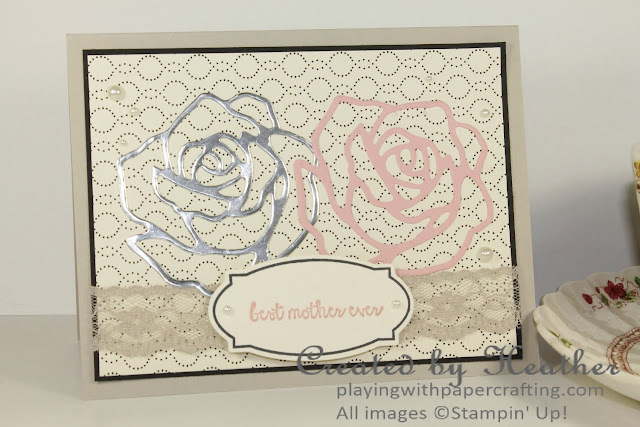 The sentiment, from the And Many More set, which is retiring come June, fits perfectly inside the label stamp from Rose Wonder, and then you can die cut them using the label framelit from Rose Garden. Only one month until this new Annual Catalogue goes live, and you're going to want your own hard copy of it so you can plan your strategy. Regular customers will have a copy delivered in their next order, so the fastest way to get one is to place an order with me. Otherwise, let me know that you would like a copy and I will mail you one (or hand deliver if you're in my area) for just the cost of postage.